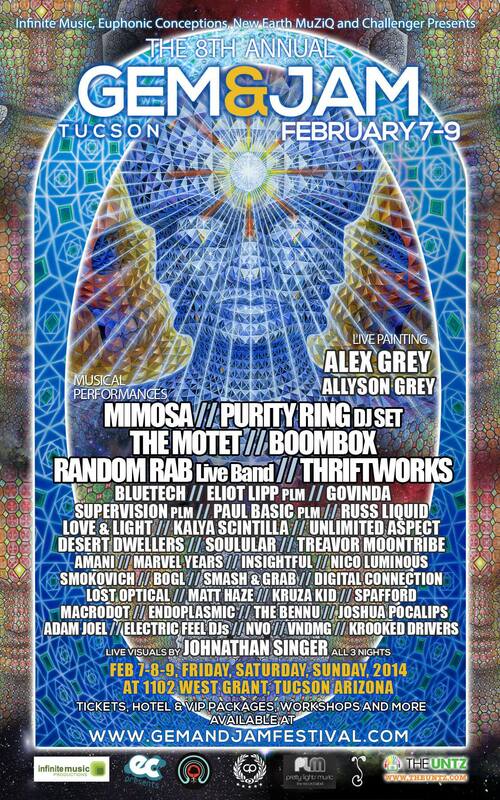 Get going to this years 8th annual Gem & Jam fest in Tucson, AZ hosted by Euphonic Conceptions! Alex & Allyson will be headling this magical weekend in February. Can’t wait to dance the night away to some of my favorite artist right now and check out some of the worlds most precious gemstones!!! The lineup speaks for itself and for a three night festival is packed with incredible talent from all over the world. THE 2014 GEM & JAM FESTIVAL Feb 7,8,9 !! Performances, Live Dancers, Fire, and more! @ 1102 W. Grant St. SINGLE DAY TICKETS will be $45 – with a $5 discount if you have an Arizona ID !